We are Super Hosts on AirBnb, check out our reviews. Private entrance, private 2nd floor suite on gated property. Two bedrooms with queen size beds, each with private bathroom with walk in showers, plenty of towels, shampoo, conditioner and soap. Flat screen TV's in each bedroom with cable. Each bedroom has individually controlled heating & air conditioning. Sitting room with sofa bed that can sleep 2 additional people, maximum of 6 guests. Sitting room has a game table, with games, sink, microwave, coffee, tea, mugs, wine glasses and under counter fridge. Separate storage area with plenty of extra towels and paper goods, iron & ironing board. 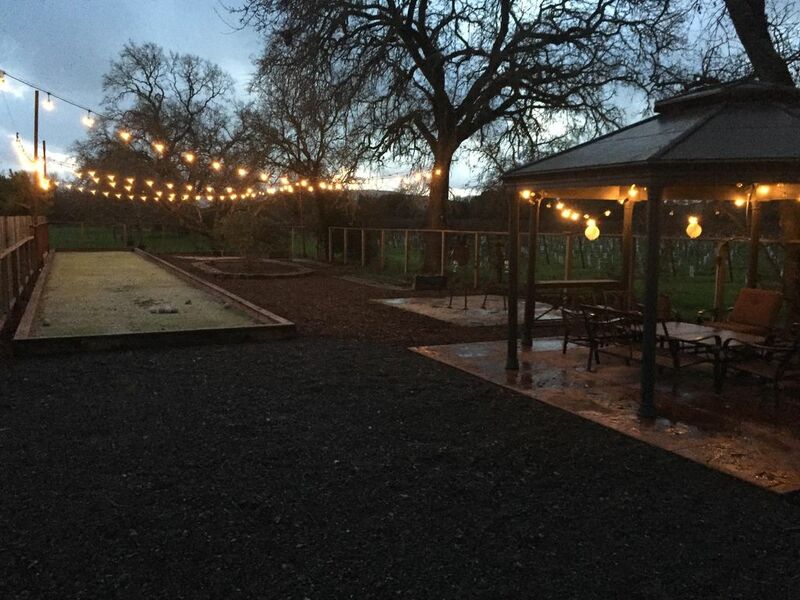 Night lighted Bocce Ball court, horseshoe pitch and gazebo with vineyard views. A balcony with beautiful sunset views with cafe tables and chairs. 1 mile to Sonoma town square and wineries. Across from a lovely creek-side walking path complete with resident ducks, less than a mile to town and convenient shopping center, Whole Foods market, CVS pharmacy etc..
Small local market with great fresh made sandwich bar 2/10's of a mile away at the corner of Broadway & Leveroni. Fruit trees, olive trees, nut trees and grape vines, you will love this beautiful and convenient location! Newly built, with lots of easy parking on gated property. I have lived in many parts of Sonoma County for the past 20+ years giving me an opportunity to explore different part of the region. For the last 10 years I have been a winemaker. Being able to travel to over 40 states and 40 countries has opened the world to me through laughter, food, culture, people and language....a joy and passion that constantly beats. With all my adventures under the sun & moon, Sonoma is where the heart beats. You'll know when you visit! Bocce ball court and horseshoe pitch, lovely gazebo and outside areas to enjoy. Beautiful wine country feel surrounded by vineyards, olive trees, fruit trees, and lavender. Great sunset views looking out over the mountains to the west from your private balcony with cafe tables and chairs. toilet, shower, Walk in shower, heater and exhaust fan, all amenities. Bedrooms have individually controlled heating and air conditioning. Easy convenient parking on our gated property. Internet available throughout the property. Sitting room has a game table and chairs, with games, sink, microwave, coffee, tea, mugs, wine glasses and under counter fridge (see listing picture). Under cabinet fridge with small freezer (see listing photo). Regular and decaf coffee, electric kettle and tea (see listing photo). Coffee & tea mugs, wine glasses, paper plates and limited utensils. Flat screens in both bedrooms. Fruit trees, olive trees, nut trees and grape vines. With 2 cafe tables and 4 chairs, sunset, mountain and vineyard views. Well maintained public and semi public courses within a 1/2 hour drive. Away from it all, yet only a mile to the historic Sonoma town square, full of tasting rooms and eateries. Beautiful creek side walking path to town starts across the street. The property is very pretty and private. Loved picking fresh cherries for breakfast. Really enjoyed walking into town for dinners, wine, etc. Thsnks for your hospitality! In the heart of the Sonoma Valley, beautiful California wine country. Many, many vineyards and tasting rooms, lots within walking distance. Lots of wine tour operators or easy exploring on your own. Great restaurants and shops. The California wine country experience at it's best. Elegant, informal and relaxed. You can easily explore Napa too which is 13 miles away.